Your body needs a small amount of sodium to be healthy, but how do you know how much is too much? We all know to expect a sodium overload when we head out for a pizza night or order that extra-large bucket of popcorn at the movies. But salt has a way of sneaking into one’s diet in so many more ways than we realize, and it’s not all coming from the salt shaker (or that fancy Himalayan pink salt grinder). Salt is nearly impossible to avoid. Unless you prepare every scrap of food yourself, you’ve probably eaten too much salt at one point or another. If it comes packaged, canned, or frozen — basically if it’s made by pretty much anyone other than yourself — chances are good that it’s chock-full of sodium. Processed foods are packed with the stuff! But salt isn’t necessarily the villain it sometimes appears to be. Sodium is necessary for nerve health and healthy blood pressure, and it helps the body absorb certain nutrients. You need a small amount of salt daily to remain healthy, but too much can cause detrimental side effects. The American Heart Association recommends a maximum intake of 2,300 milligrams a day, although 1,500 milligrams per day would be ideal for most adults. The average American consumes over 3,400 milligrams of sodium each day (one and a half times the recommended amount! ), with 70 percent of it coming from packaged foods. Here are some common signs that it may be time to put the shaker (or box or can) down. 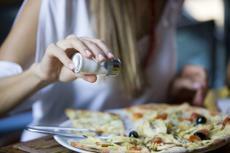 Click here for signs you're eating too much salt.